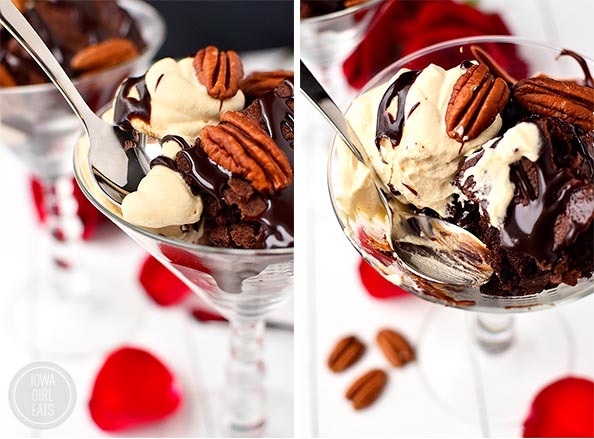 Gluten-Free Turtle Brownie Sundaes with Salted Caramel Whipped Cream and Homemade Hot Fudge Sauce are decadent and over the top. Make-ahead, too! Pull out your cupid-adorned stretchy pants – Valentine’s Day dessert has arrived and it’s as decadent as it is delicious! 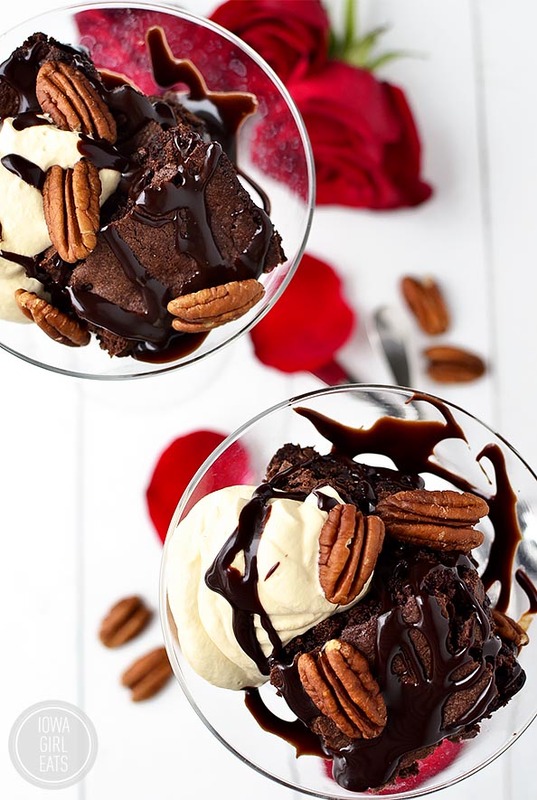 Gluten-Free Turtle Brownie Sundaes with Salted Caramel Whipped Cream and Homemade Hot Fudge Sauce are not only going to make your tastebuds explode, but they’re 99% make ahead, too. Because who wants to be shuffling around in the kitchen making last minute dessert on Valentine’s Day night? Recently I asked my Facebook followers if they wanted to see a chocolate or cocktail recipe to celebrate the sweeter side of the holiday and the resounding reply was CHOCOLATE, YOU CRAZY PERSON! Ask for chocolate, and double chocolate is what you shall receive…and salted caramel whipped cream plus crunchy pecans, because I’m crazy like that. Gluten-Free Turtle Brownie Sundaes with Salted Caramel Whipped Cream and Homemade Hot Fudge Sauce are masterpieces in martini glasses. Store-bought gluten-free brownie mix brownies (yup!) are sliced then topped with salted caramel whipped cream (my newest obsession,) homemade hot fudge sauce that tastes like warm brownie batter, and crunchy pecan halves. This dessert is sweet, a little salty, creamy, chewy and crunchy. Long story short, it has it all! There’s a tiny little chocolate shop in town called The Chocolate Storybook that’s been around for decades, and they sell the best chocolate turtles – caramel and pecan clusters drizzled with melted chocolate. Growing up my Dad bought a box for my Mom and me on Valentine’s Day each year and they’ve remained a favorite since then. Meant to be a sweet, two-bite treat, my Mom was lucky if she got her half of what was, for me, a one-bite must-have! This year I decided to give the classic turtle a little upgrade and transform it into a decadent dessert that’s perfect for sharing with your loved one, whether that be your husband, wife, son, daughter, friend, or relative. Show ’em you care with this rich, chocolatey, and ultra special treat. It’s a special occasion dessert to be enjoyed to the last drop! 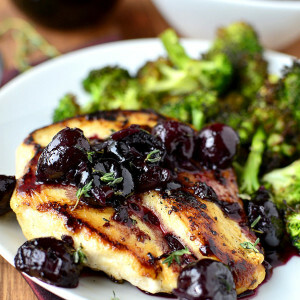 First things first, this recipe is sponsored by Fisher Nuts whom I’ve been developing recipes for over the past couple of years. 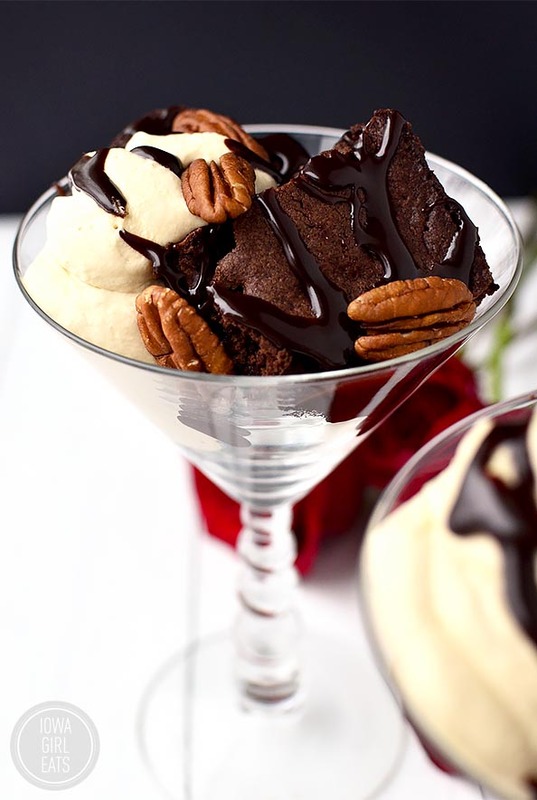 Their nuts are high quality, super fresh, preservative-free, and I especially love their pecans which give this sweet dessert a satisfying crunch amongst the gooey brownie, silky hot fudge, and fluffy whipped cream. Walnut turtles are also popular, but the creamy-soft chew of pecan turtles have always been my favorite. 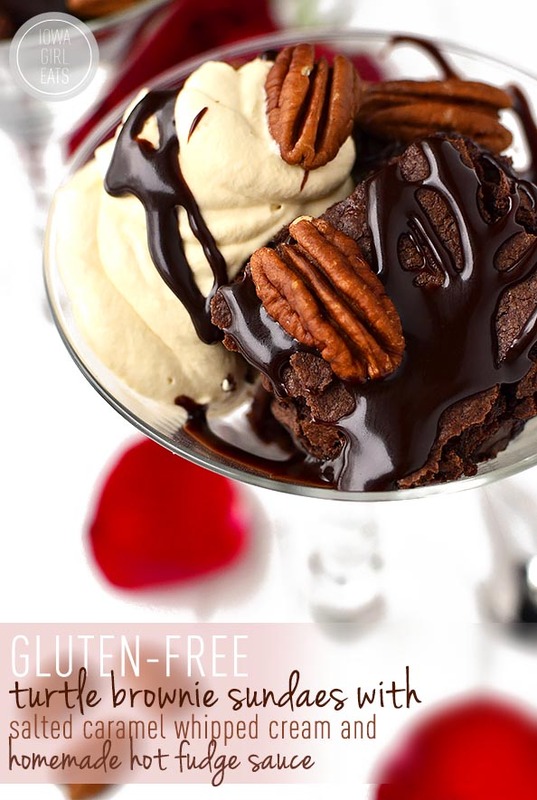 Start the gluten-free brownie sundaes by making the gluten-free brownies. Bet you didn’t see that one coming. :) Here’s my secret to perfect gluten-free brownies…buy a mix. I know I might get a few comments about that but holy cow, they are so, so good. I’ve used both the brands in the photo below and they’re equally gooey, fudgy and lusciously chocolatey. I’d never know they were GF if I didn’t buy the box myself! That said, make the brownies according to package directions (you’ll likely need an egg, oil and/or water,) then cool completely and slice into 3×3″ squares. You can make the brownies up to two days ahead of time but wait to slice until you’re ready to serve. Next make the salted caramel for the salted caramel whipped cream. People – brace yourselves. This whipped cream is next level!! I love how it’s got a salty bite to cut through the richness of the dessert. Start by combining 1/4 cup sugar, scant 1/2 teaspoon salt, and 1 Tablespoon water in a small saucepan. Stir gently to combine then turn the heat to medium and let the mixture bubble and turn caramel brown (be careful as it can burn shortly after turning caramel brown.) You don’t even need to stir during the cooking process. Just let the caramel do it’s thing – the color will tell you when it’s done! Remove the caramel from the heat then slowly stream in 1 cup heavy whipping cream that’s been warmed to room temperature. If the caramel hardens when you add the cream, it just means the cream was too cold. Simply place the saucepan back over medium heat then stir until it melts again. Carefully pour the salted caramel cream into a bowl over a larger bowl of ice then chill completely, stirring occasionally. You can do this up to two days ahead of time too. Just pop a lid on top and store in the refrigerator. 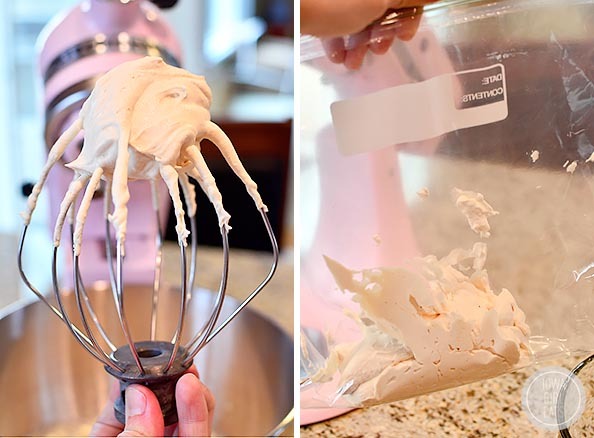 When you’re ready to whip, place the salted caramel cream mixture into the chilled bowl of an electric mixer, or a large glass bowl if you’re using a hand-held mixer, then whip on low speed for 30 seconds. Increase the speed to high then continue whipping until the cream can hold it’s shape, 2-3 minutes. Scoop the whipped cream into a large ZipLock bag then stash in the fridge until you’re ready to assemble the desserts. Salted Caramel Whipped Cream = done! Finally, make the homemade hot fudge sauce. You could of course buy store-bought hot fudge sauce but making it homemade takes less than 10 minutes and it really does taste so much better. I don’t feel guilty about buying a store-bought brownie mix because I know it tastes better than anything I’d probably make at home – if nothing else, the chewy texture makes it a no-brainer – but homemade hot fudge sauce…there’s nothing better. 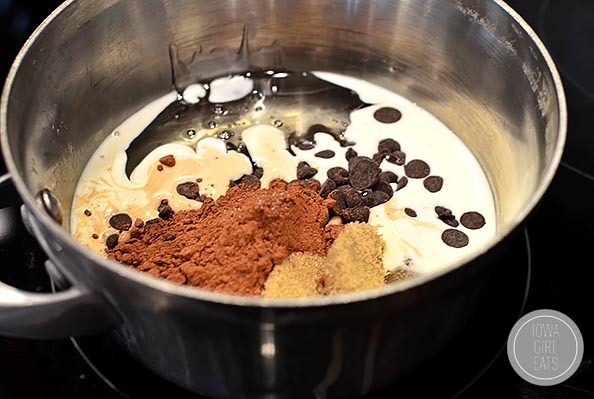 Simply combine 3oz semi-sweet chocolate chips, 1/3 cup heavy whipping cream, 1/4 cup light corn syrup, 2 Tablespoons brown sugar, 2 Tablespoons unsweetened cocoa powder, and a pinch of salt in a small saucepan then bring to a bubble over medium-high heat, whisking constantly. Turn the heat down to medium-low then whisk and cook for 3 minutes before stirring in 1-1/2 Tablespoons butter and 1 teaspoon vanilla off the heat. This can be done up to a week ahead of time. Pour the hot fudge sauce into a mason jar using a funnel then store in the refrigerator. 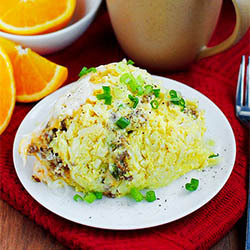 To reheat, scoop a serving into a glass dish then microwave for 20-30 seconds. Homemade hot fudge sauce = done! Assembly time! Place two or three brownies into the bottom of a martini glass for a festive presentation, then snip the corner off the Ziplock bag with the Salted Caramel Whipped Cream and pipe into the glass. Drizzle with warm homemade hot fudge sauce then sprinkle on the crunchy whole pecans. Grab a spoon, and your date, and dig in! For the Salted Caramel Whipped Cream: Add ice to a large, wide bowl then place a smaller bowl on top of the ice and set aside. Add sugar, water, and salt to a small saucepan then stir gently to combine and turn heat to medium. 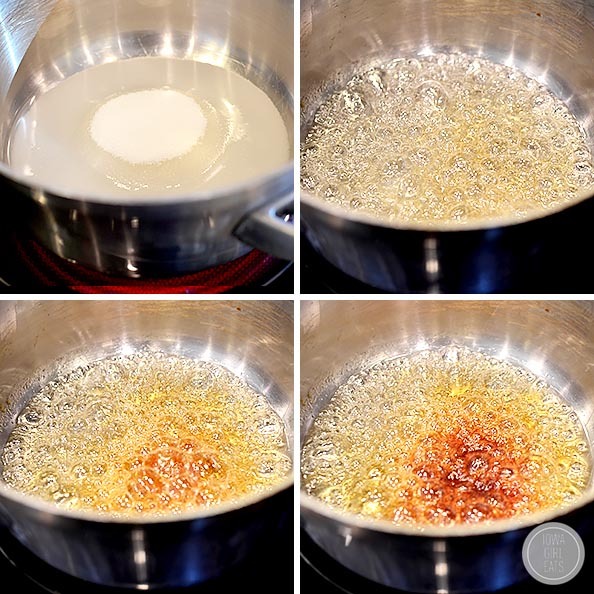 Cook without stirring until mixture turns caramel brown, 4-5 minutes (watch closely as mixture can burn quickly shortly after turning caramel brown,) then remove from heat, slowly stream in heavy whipping cream, and then stir to combine. If any caramel hardens, continue to cook and stir until it re-melts. Pour mixture into bowl set atop ice then chill completely, stirring occasionally. 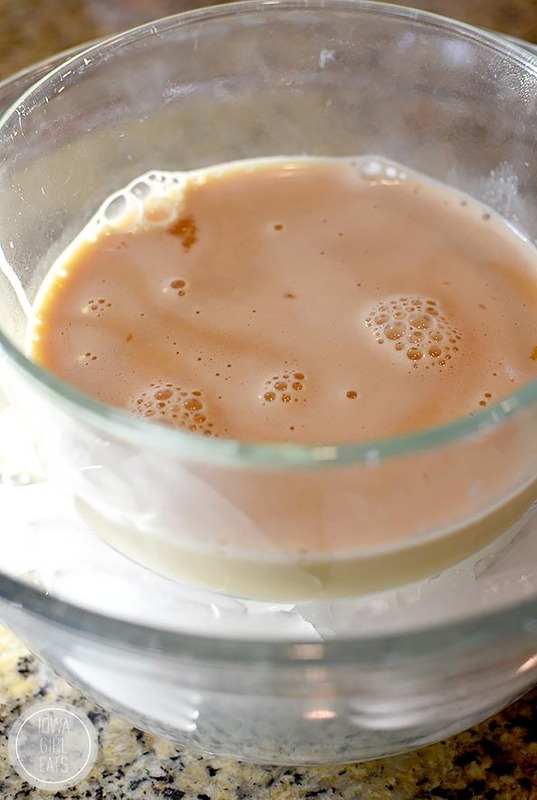 Can be done up to two days ahead of time, store salted caramel cream mixture in the refrigerator. Place the bowl of an electric mixer, or a large glass bowl if using a hand-held mixer, into the freezer for 10 minutes then add salted caramel cream to bowl and fit mixer with whipping attachment. Whip on low speed for 30 seconds then increase speed and whip until cream is thick and holds its shape, 1-2 minutes. Scoop into a large Ziplock bag then refrigerate until ready to assemble desserts. 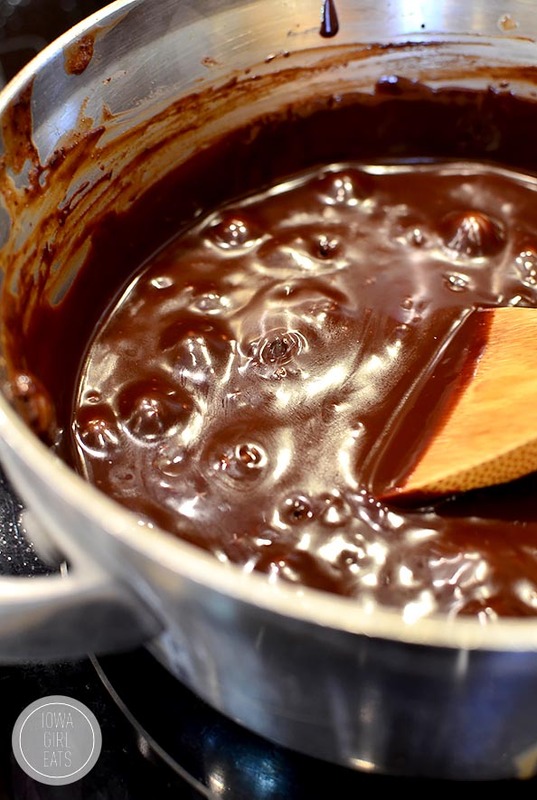 For the Homemade Hot Fudge Sauce: Add chocolate chips, heavy whipping cream, corn syrup, brown sugar, cocoa powder, and salt to a medium-sized saucepan over medium-high heat then whisk constantly until bubbling. 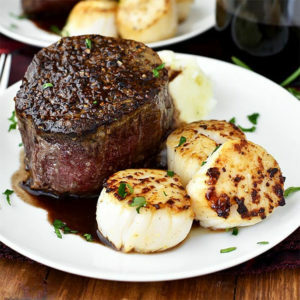 Turn heat down to medium-low then continue cooking while whisking for 3 minutes, being careful of spatters. Remove pan from heat then stir in butter and vanilla. Cool hot fudge sauce slightly before using or pour into a jar with a tight fitting lid using a funnel then store in the refrigerator. Can be made up to a week ahead of time. Reheat hot fudge sauce in a small dish in the microwave in 30-second intervals, stirring between intervals. Place brownie squares into martini glasses then snip the end off the Ziplock bag containing Salted Caramel Whipped Cream and pipe into glasses. 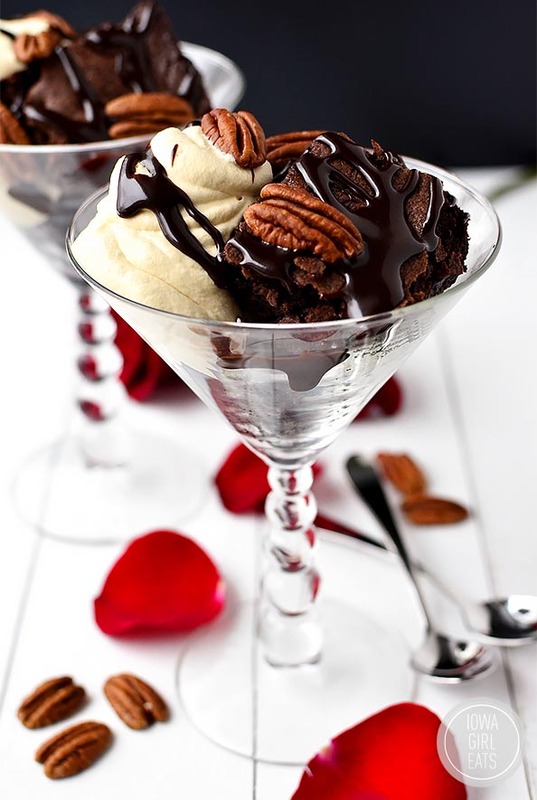 Drizzle hot fudge sauce on top then sprinkle with pecans and serve. 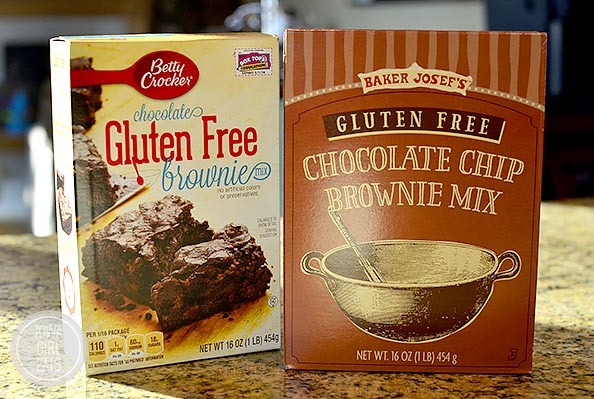 I have used both Trader Joe’s and Betty Crocker brand gluten-free brownie mixes in the past and love them both! Salted Caramel Whipped Cream slightly adapted from Martha Stewart. Over the top in every decadent way possible. Enjoy this upgraded, super sweet and special treat! so so naughty but i LOVE IT! I’ve just posted an equally as naughty treat for Val’s day :) we will both be getting a lot of attention from the male race if we hand these to them on a plate ! Thanks for sharing. We’ve been trying to cut down on dessert but you better bet we are making something with chocolate this weekend! This cheat would be so worth it. 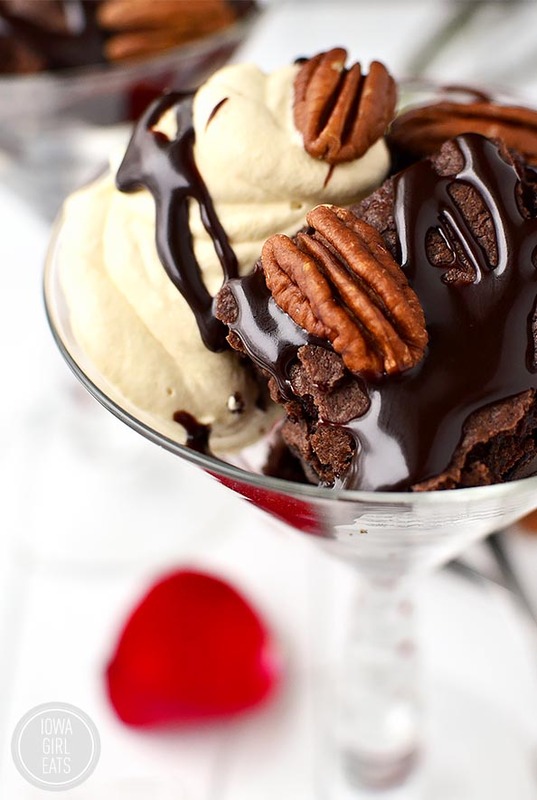 There’s just something about a brownie sundae I can’t say no to! Um…people are kidding themselves if they think they can make brownies homemade better than a good ole fashioned box. There really is NOTHING. BETTER. I mean ooey gooey people!! 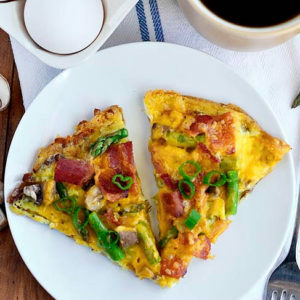 These look insanely beautiful and delicious. And you’ve gotta love the convenience (and, honestly, taste) of a boxed brownie! Adore that you fancied it up a bit! Love the serving them in martini glasses. I am trying to make sure that my beloved doesn’t take me out to eat for Valentine’s Day. This may be an excellent reason to stay home. Now to track down something equally fantastic (and mostly simple) to make for dinner. Holy cow. These look AMAZING! 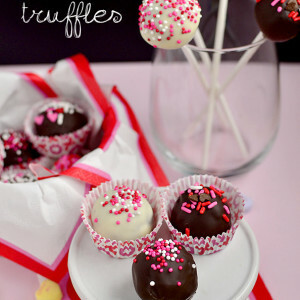 These look like the perfect little Valentine’s treat. I bet your dad was quite loved bringing home those amazing Turtles! Have you tried the Krusteaz brand GF brownies? The double chocolate brownies are by far our favorite GF box mix and can be found at most Fareway’s in the metro-area! No I totally know what you mean – those brownies are TO DIE FOR! You know what would be even more over the top? 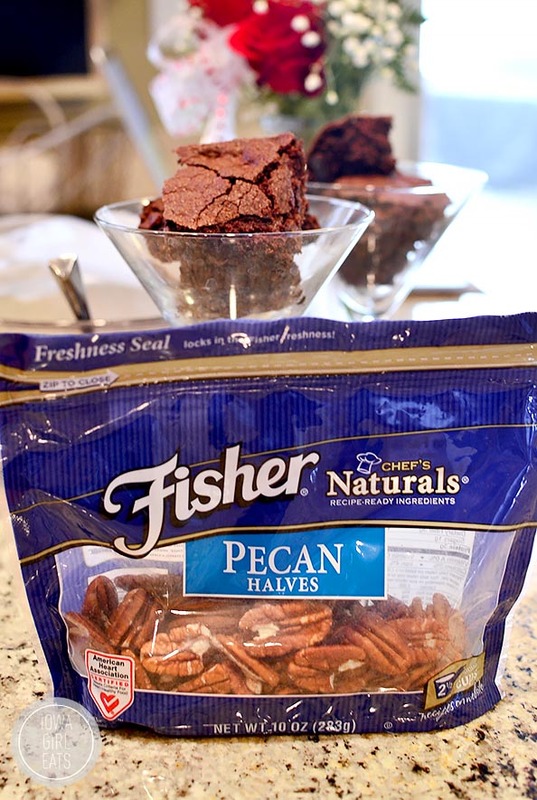 if you candied the pecans!! woot, woot! Long time reader, absolutely luv ya, but…you know you don’t have to remind us that you took the Go Sugar Free Course every time you post something with sugar in it, right? We get it-you’re over dessert-and we’re happy for you, but not all of us are on that bandwagon or have any desire to be on it. Again, love what you do, but you don’t need to throw that qualifier in every time you post something with sugar in it. These look absolutely fantastic! I can’t wait to try them. Turtles are my all time favorite. Love that you turned them into a sundae without just chucking a bunch of turtle candies on top. Absolutely stunning photos, friend! I’ll take like three of those, please ;D Happy v-day! Just made the hot fudge sauce in prep for tomorrow. 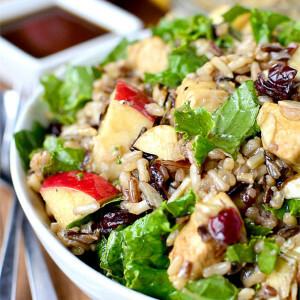 Tempted to say forget the rest and just eat a bowl of that! To.Die.For!!!! !